The EC published details of the China trade, some questions are still unanswered. The trade dispute over Chinese modules and cells regarding the minimum import price was approved on Friday. Still, some questions have not been answered. Some details about the EC’s trade dispute have been published in the 6th of August edition of the Official Journal. The EU reported that it agreed with the compromise. The decision reveals details about the way that the negotiation lead to a minimum price for the freely imported PV. The first step the commission took was to verify whether a minimum price could be associated with the indexes of some commodities. PV modules do not permit an easy correlation between the commodity prices and retail prices. It is implied the the EC used indexes compiled by Bloomberg and pvXchange. However details about the specific minimum prices will nor be revealed. But, accordind to the media reports the price range is between €0.56 and €0.57 per watt with the ceiling on imports from China set at 7 GW. -Imports of participating companies will reflect current annual levels. But what is the correct annual level in such a fast changing market? -What happens if the targeted annual level is exceeded, and how will individual producers, in this context, be coordinated? -Price indexes compiled by Bloomberg and pvXchange were used for the negotiated minimum price. The document does not explain how changes in the minimum price will be negotiated. 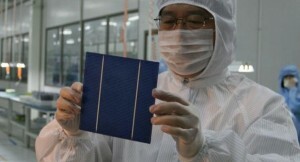 -How will modules be treated that are not manufactured in China nor the EU, but that contain Chinese cells?